FAMOUS MATHEMATICIAN - Augusta Ada King, Countess of Lovelace was an English mathematician and writer, chiefly known for her work on Charles Babbage's proposed mechanical general-purpose computer, the Analytical Engine. The mother of computing science; contributed to the first published computer program; was the first person to see that computers could do more than mathematical calculations, recognizing that musical notes and letters of the alphabet could be turned into numbers for manipulation by computers. 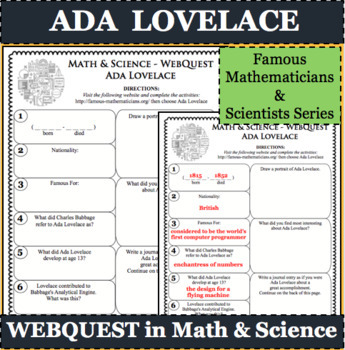 Engage your learners in fun, interactive, and creative ways to discover more about ADA LOVELACE using this WebQuest. Activity is differentiated allowing students to respond to open-ended questions reaching individual levels. INSPIRE your students!